It was called the "Trial of the Century," yet decades later (and in a new millennium at that), the story of a beloved sports icon at the center of the most publicized murder trial in American history continues to fascinate generations. Orenthal James Simpson, better known as O.J. Simpson or "The Juice," and his trial for the murders of ex-wife Nicole Brown Simpson and friend Ronald Goldman is the subject of FX's The People v. O.J. Simpson: American Crime Story, which premiered Tuesday. Given where Simpson is now, the primetime retelling of the mid-1990s court drama and shocking acquittal is a harrowing journey down memory lane. Simpson is currently behind bars for multiple felonies, including armed robbery and kidnapping. In September 2007, Simpson and a group of men charged a Las Vegas hotel room to steal his own sports memorabilia, which he claimed were first stolen from him. Simpson pleaded not guilty to the 12 counts held against him. After some of his fellow co-defendants accepted plea bargains in exchange for their testimony against him, Simpson was found guilty on all counts and sentenced to 33 years in prison on Dec. 5, 2008. Simpson is serving time at Lovelock Correctional Center Facility in northern Nevada and will be eligible for parole in October 2017. His latest appeal was rejected last September. Simpson first found fame as a dominant force in football, winning the Heisman Trophy in 1968 as a running back for the University of Southern California. He then went on to play 11 seasons in the NFL, first with the Buffalo Bills and then the San Francisco 49ers. 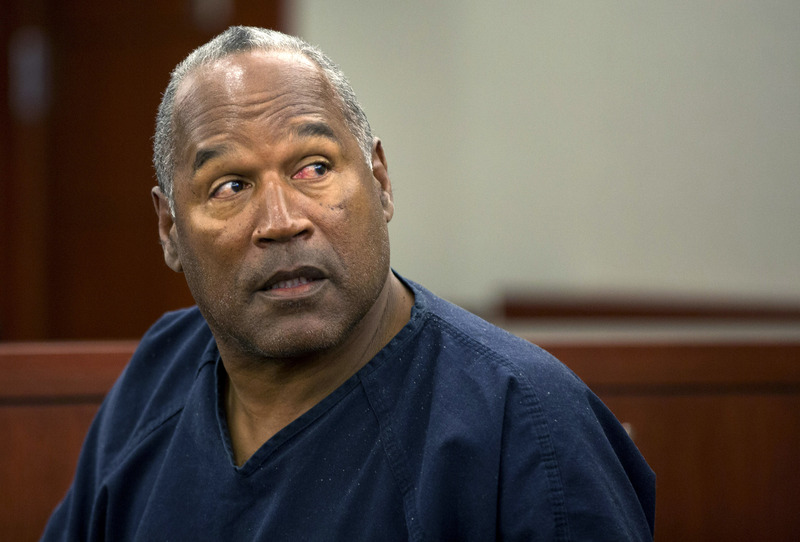 His post-NFL popularity led to lucrative endorsements and business deals, and Simpson was a staple among Los Angeles' elite at the time of his murder trial. Simpson's arrest for the murders of Brown and Goldman shocked an entire country, and a whopping 150 million people tuned in to watch his verdict on Oct. 3, 1995 — compare that to 114.4 million viewers who watched the 2015 Super Bowl — making the climactic moment one of the most watched events in TV history. Though he was acquitted for the two murders, Simpson was found liable in civil courts for the wrongful deaths of Brown Simpson and Goldman and had to pay $33.5 million in damages to their families. Twenty-one years since his infamous acquittal, Simpson continues to be a source of intrigue and consternation for the American public. There's renewed interest not only with American Crime Story, but also in ESPN's documentary OJ: Made In America, which will air in June and has already received rave reviews. His tale of affluence, race, and murder against the glamorous backdrop that is Los Angeles will forever go down as one of the biggest real-life Hollywood stories to ever shake the American consciousness.